Secondly and more important, I fell in love with the recipe with braised pears with cabbage confit and white chocolate-onion puree and that specific recipe asked for Bartlett pears. Only available around this time in Holland. So, finally. Last week I had the pears and was ready to rock and roll in the kitchen! The book ranges from appetizers, soups, smoothies, vegan cheeses, crackers, main dishes and delicious desserts. It is truly an extensive work filled with taste and passion! It’s a mix of easy and some more tricky recipes to make for the chef at home. 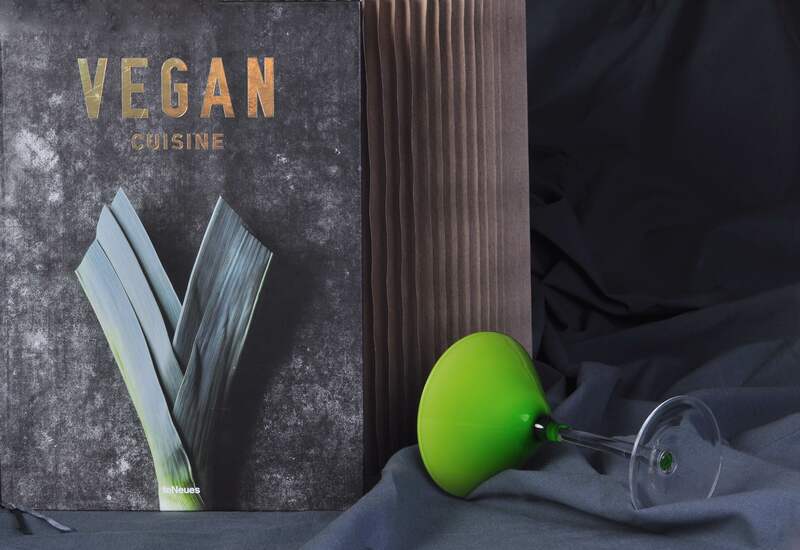 The book has a clean and easy to read design with beautiful photos from the world-renowned food photographer Joerg Lehmann. Unfortunately there is not so much photos as one could have whisked for. Understandable due to it’s already huge size but still a pity. Another point that I miss is the personal touch in the book, somewhere an opening from the author or some tips what to combine al the fantastic sauces, jams and gel with. But these are really just small details, the book is fantastic as a source for inspiration and encyclopedia for just really flavorful vegan food! From the book I have chosen to make braised pears with cabbage confit and white chocolate-onion puree. A sweet main dish with many layers in the flavors. The three components in the dishes are easy to make on their own as well and combine with other dishes. The cabbage confit is really super easy to make and get a great taste from the mustard and caraway seeds. So good! 1. Preheat the oven to 375°F/190°C. Combine the vinegar, sugar, thyme, brown sugar, nutmeg, and bay leaves in a saucepan and cook over medium heat until reduced to a syrup. 2. Remove the bay leaves and prepare the pears. 3. Place the pear halves in a 9×13 inch / 23×23 cm baking dish, dab with the margarine and drizzle the syrup. Bake for 30 minutes. 1. Reduce the oven temperature to 355°F/180°C. Combine all the ingredients, including salt to taste in a 9×13 inch / 23×23 cm baking dish. 2. Cover with foil and cook for 1 hour, until tender. Season with additional salt to taste. 1. Place the onions, margarine and salt to taste in a Dutch oven and cook over medium heat for about 30 minutes, stirring occasionally, until very soft. 2. Transfer to a blender, add the grated white chocolate and blend until smooth. Adjust the seasoning if needed. To serve, place some of the red cabbage on each of 4 plates. Arrange 4 pears halves on each plate of cabbage. Spoon about 2 tablespoons of the onion puree on top of the pears and serve.